Habit: Perennial herb to subshrub, < 10 dm, much-branched, hairs 0 to sparse. Stem: angled to ribbed. Leaf: 2--7 cm, lanceolate to elliptic, entire, wavy or not, tapered to base. Inflorescence: +- umbel-like; pedicels 13--18 mm, > peduncle. Flower: calyx 4 mm; corolla 17--22 mm wide, generally blue-purple (white), lobes << tube, each with 2 green spots at base; anthers 3.5--5 mm. Fruit: 7--10 mm. Seed: +- 2 mm. 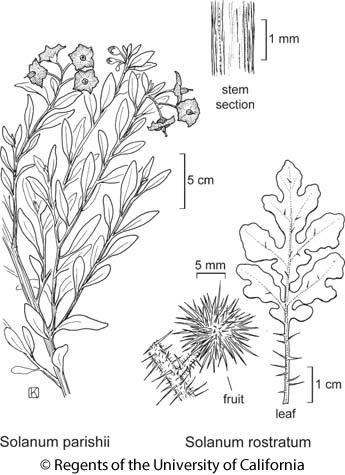 Ecology: Dry chaparral, oak/pine woodland, pine forest; Elevation: < 2000 m. Bioregional Distribution: NW, CaR, SN, ScV (Sutter Buttes), CW, SW, MP; Distribution Outside California: southern Oregon, Baja California. Flowering Time: Apr--Jul Note: May hybridize with Solanum xanti; needs study. Citation for this treatment: Michael H. Nee 2012, Solanum parishii, in Jepson Flora Project (eds.) Jepson eFlora, http://ucjeps.berkeley.edu/eflora/eflora_display.php?tid=44885, accessed on April 23, 2019. NW, CaR, SN, ScV (Sutter Buttes), CW, SW, MP; Markers link to CCH specimen records. Yellow markers indicate records that may provide evidence for eFlora range revision or may have georeferencing or identification issues. Purple markers indicate specimens collected from a garden, greenhouse, or other non-wild location.